John Robinson [1935 - 2007], artist and co-founder of the Bradshaw Foundation, first met Dr. Jean Clottes in 1994 in Flagstaff, Arizona at the International Rock Art Congress hosted by the American Rock Art Research Association (ARARA), where the Foundation was promoting its recently published book 'Bradshaws - Ancient Rock Paintings of North-West Australia'. What began as a formative collaboration between the eminent French prehistorian and John Robinson, Director of the Bradshaw Foundation, soon became a strong friendship. 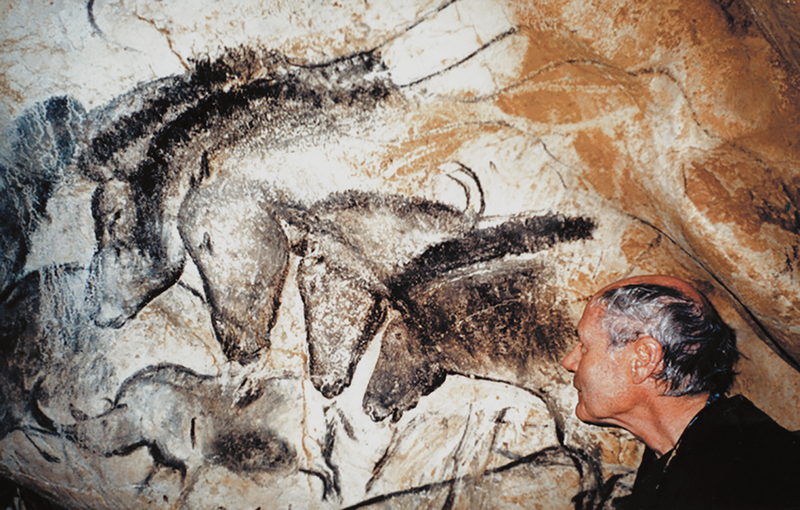 In 1996, only 4 years after Chauvet's discovery, Jean Clottes and his scientific team were chosen by the French Ministry of Culture to investigate the cave and its extraordinary cave paintings and pristine archaeological artefacts. In 1999, merely three years later as the preliminary results of Jean Clottes' scientific analysis of the Palaeolithic cave paintings were sending shock waves through several academic fields around the world, John Robinson was honoured to be invited into Chauvet Cave. Clearly, Dr. Jean Clottes was keen to observe the insight of a modern day artist; for the artist, he was about to embark on one of the greatest experiences of his life. When Jean Clottes invited me to join his Team for the Investigation of the Chauvet Cave paintings, that was discovered on the 18th December 1994, he warned me that I would not be able to visit until the entrance had been widened, and he thought that this would take at least 18 months. That didn't worry me in the least as after seeing the photographs of the Chauvet Cave paintings, I would have been happy to have waited three years, or five. Ten might have been asking too much! Also I had heard Jean's own story of his first visit to the cave with Jean-Marie Chauvet, Eliette Deschamps, and Christian Hillaire. I don't have any trouble with tight spots in caves, in fact rather enjoy the challenge, but I am not sure that squeezing through a foot high down hill letterbox for 25 feet was quite my cup of tea. I was happy to wait until the tunnel had been widened. How do you prepare yourself for a visit to see the oldest known cave paintings in the world especially when you have seen the photographs and know that you are going to see works of astounding beauty? I had over a year to prepare myself for what was going to be one of the great artistic experiences of my life, as was my visit to the Sistine Chapel. I decided that where possible I would avoid looking at any photographs of cave paintings from Chauvet for the coming year. Unfortunately I would occasionally see pictures in magazines, but I purposely didn't study them, only read the articles. I wanted the paintings to be as fresh to my eyes as it was possible. At last the appointed day arrived, the 18th of October 1999 was a glorious sunny day. My wife and I drove south through France from Lyon along the Rhone River, and turned west at St Just into the Gorges de L'Ardeche. I wanted to get the feeling of the environment in which the cave is situated. The Gorges is one of the most spectacular Canyons in Europe, and can be well viewed from several vantage points along the road that follows the top of the sheer cliffs, from where you can look down on the crystal clear river. At the head of the canyon, just before reaching Vallon-Pont-d'Arc, the road descends to the river. Rounding a bend we were suddenly confronted with a glorious freak of nature, the Pont-d'Arc. The river has cut straight through a rock barrier; thus creating an enormous and majestic Arch that spans the flow. A canoe was being paddled under the arch the moment we arrived, giving the scene a remarkable perspective. The Arch of Pont d'Arc is a wonder to behold. What would it have meant to the Chauvet People 30,000 years ago? Would it have represented an animal as Jean suspects? Possibly, as in the caves the artists had often used the natural form of the rock surface to depict the animals in the Chauvet Cave paintings. I looked at the Arch and immediately saw a Lion. We found a quiet little hotel in old Vallon, and I rang Jean. He had established his HQ in a Municipal Holiday Camp, his team had set up their laboratories for the study of the cave. Jean asked me to meet him at 0830 in a car park near the Arch. The paintings of the Chauvet Cave are an archaeologist's dream come true as the whole cave is in a pristine condition, untouched by man for possibly 27,000 years, as the only visitors since the cave paintings were done have been the Bears, who used the cave for their winter hibernation. Every possible precaution is being taken to disturb nothing. As soon as the entrance had been widened, aluminium catwalks were brought in and erected on six inch high legs to protect the floor of the cave. A network of scientific apparatus constantly monitors the temperature, and humidity of the cave.